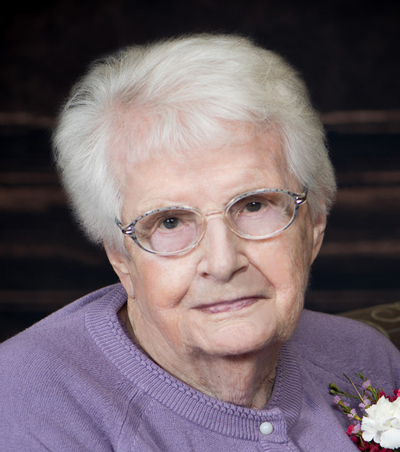 Agnes Kliewer, age 100, of Aurora, passed away Wednesday, January 24, 2018, at Memorial Community Care. Funeral Services will be held at 11:00 A.M., Monday, January 29th at the Stockham Community Church in Stockham. Rev. Paul Nauman will officiate. Interment will be in the Friesen Cemetery west of Henderson at 10:00 A.M. Visitation will be from 5 - 7 P.M. Sunday at Higby-McQuiston Mortuary. Memorials may be made to Memorial Community Care. Condolences may be e-mailed to the family through the mortuary website at www.higbymortuary.com. Agnes Koop Kliewer was born on October 13, 1917, along with a twin brother Chris to Cornelius H and Katherina (Peters) Koop in York County, Nebraska. She died at Memorial Community Care, Aurora, Nebraska on January 24, 2018 at the age of 100. She was baptized on June 5, 1938 by Rev A W Friesen, and became a faithful member of Bethesda Mennonite Church until the time of her death. She was also a Charter Member of Mission Circle I. She married Henry J Kliewer on April 9, 1942. Three children were born to this union - Dorothy, Deloris, and Delmar. On March 1, 1976 they retired from farming and moved to Henderson, Nebraska. After Henry's death October 1, 1991, Agnes continued to live in Henderson for the next ten years. On April 8, 2001 she moved to East Park Villa in Aurora, Nebraska. Due to declining health she moved to Sutton Community Home August 5, 2015. In December, 2016 she moved to Memorial Community Care. Survivors are her children Deloris and husband Donald Reinhold, McPherson, Kansas; Delmar and wife Fay Kliewer, Stockham; son-in-law LeRoy Walter, Bridgewater, South Dakota; seven grandchildren - Denise, Dawn, and Ryan Walter, Michael and Dawn Reinhold, Alan and Heather Reinhold, Krista Sisco and Matt and Tony Kliewer; six great grandchildren - Kadyn and Tristan Sisco, Madden, Beckett, Watson, and Zoey Kliewer. Preceding her in death were her parents, her husband Henry, her daughter Dorothy, her sisters and brothers - Tena, Marie, Chris, Helen, and Dan.